Shorba is Arabic for soup. Soup, as the word goes, A liquid food of many kinds, usually made by boiling meat and vegetables, or either of them, in water, commonly seasoned or flavored; strong broth. The origin of soup is connected with the discovery of pottery and the invention of containers that could hold cooking liquid on the fire without breaking. This technique was available in the Mediterranean areas about 5000 B.C. The word soup originates from "sop", a dish originally consisting of a soup or thick stew which was soaked up with pieces of bread. The modern meaning of sop has been limited to just the bread intended to be dipped. suupa (Sanskrit) = suppa (Latin) = soup (English)Ref-wikipedia. 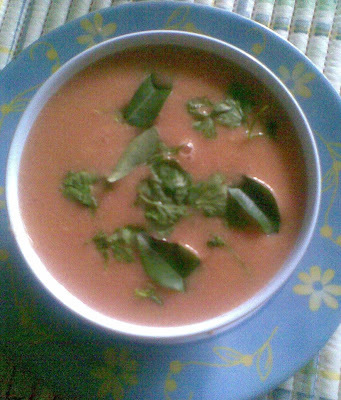 Tomato shorba as compared to tomato soup is very light and spicier .The basic difference is the addition of coconut. 2. Make out thin coconut milk from grated coconut. 3Add the gram flour to the coconut milk and mix well. 4.Heat the ghee and fry the cumin seeds for a few seconds then add green chillies and fry again for few seconds. 5.Add tomato puree, coconut milkmixture, sugar and salt. 6. Cook for few minutes garnich with corriender and serve hot. This soup looks nice..gud details.. Here's a time to celebrate and njoy Festive seasons. Thankyou suma for your sweet compliments.. next time I will try..